I don't know about you, but I've tried being the author of my own life. I much prefer to leave that responsibility up to someone more qualified. 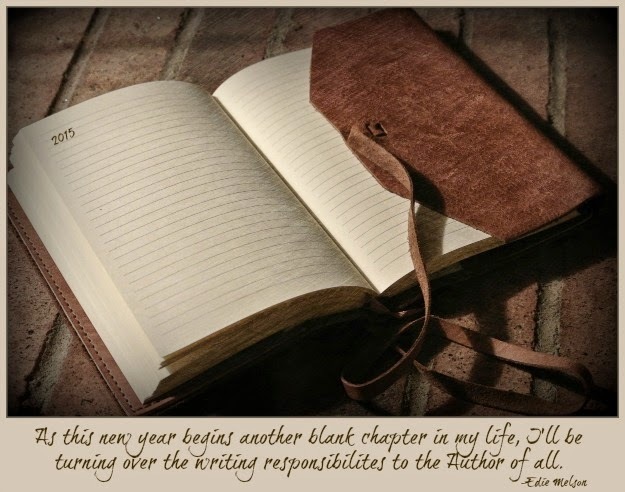 This year I'm turing the writing responsibilities over to the Author of all! Well said, Edie. Blessings for you and your family this New Year. Sounds like a good plan. Happy New Year to you. Sounds like a wonderful way to start the New Year. God is in control! The best resolution I've seen so far!! Love your plan and your journal. I have all my journals from so many years right behind me in a huge basket. I'll never throw them away. And there's nothing like having one more new journal full of blank pages! Love this, Edie! Every year I choose a word and this year it's "surrender" and your blog fits perfectly with it. Love the picture. Thanks for sharing! I love your post Edie! It's a visual reminder of why I love New Years. For me, New Years represents a chance to start over, and a clean slate. With that comes new hope, and new possibilities. But with Christ Jesus, we don't need a holiday to have that chance. All we have to do is ask. Happy New Year Edie! I miss you, and carry a piece of you with me always. I love your journal. It looks as is it is an antique. Blessings to you and yours.